Royal Caribbean operates one of cruising's most intriguing fleets. Ships range from mid-sized and middle-aged to state-of-the-art and on-the-cusp mega-ships. The line continuously updates even its oldest ships, bringing onboard the most popular features from its newest vessels. The line boasts the two biggest ships in the world - Oasis of the Seas and near-twin Allure of the Seas - and Harmony of the Seas becomes the third in the Oasis Class when it debuts in 2016. The line famously brings innovative activities to its ships, including indoor skydiving, bumper cars, surf simulators, circus school, rock climbing walls and its unique North Star, a jewel-shaped glass capsule rising 300 feet above sea level and providing 360-degree views over the sides of ships in its Quantum Class. While not gourmet, Royal Caribbean's food is usually good enough to please most of their passengers. Most of Royal Caribbean ships offer the choice of traditional two-seating dining schedule or flexible dining for dinner, with open seating in the dining room for breakfast and lunch. Passenger who opt for "My Time Dining" have to prepay gratuities. Passengers can prebook tables in the main dining room online before they cruise. Ships in its Quantum Class, including Quantum of the Seas and Anthem of the Seas, feature "Dynamic Dining, " which gives passengers the chance eat dinner at any of the ships' restaurants whenever they want, though reservations are encouraged. The Windjammer Cafe aboard all the line's ships offers breakfast and lunch buffets, and a casual alternative for dinner. On some ships, Jade, a special section of the Windjammer, offers Asian-themed dishes during the day and fresh sushi at night. What are the best luxury villa in the Caribbean? I'm no expert but from what I've read, I'd certainly be inclined to include one of the villas on Richard Branson's private island, Necker, on the list. 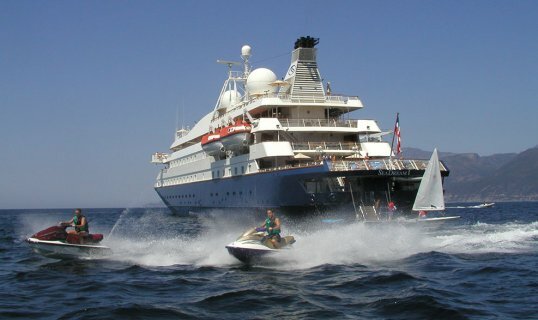 MS Black Watch is a cruise ship, currently owned and operated by Fred. Olsen Cruise Lines. She was built by Wärtsilä Helsinki New Shipyard, Finland for Royal Viking Line as Royal Viking Star, entering service in 1972. She has also sailed for Norwegian Cruise Lines as Westward and Royal Cruise Line as Star Odyssey. Fred. Olsen Cruise Lines is a UK based, Norwegian-owned cruise shipping line with four cruise ships. The company headquarters are in Ipswich, Suffolk, United Kingdom and is owned by Bonheur and Ganger Rolf. The company is part of the Fred. Olsen Group.